1- Shipping couldn’t be any easier. 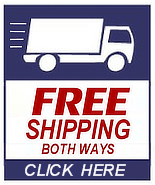 Request a FREE prepaid shipping box in this page. Once you receive the box, simply put your headphones in it and drop it at your local USPS office. That’s it! 2- If you prefer to ship the headphones yourself, then download, print, and fill out this form and put it inside the package along with your headphones. © 2019 FixHeadphones.com . All Rights Reserved. Return to Top.